Or, you CAN have too much of a good thing….Remember this old post about how each consecutive bonus to a certain process becomes less effective than the previous one? I’ll illustrate shortly with an example. Say you attack some goblins, and your attack value is 100, and you kill 100 goblins. Now you have 2 items. One increases you attack by 100%, or 100 points, and one reduces the goblins life by 50%, or half their life. Which item do you use? Well, in the first round, it doesn’t matter. Applying the attack item doubles your attack, so you kill twice the amount (200) of Goblins, while the life reduce item also results in double the amount of kills. We apply the attack item, so attack is now 200 and Goblin life still 1. Again the question, what item do you apply now? Now we see a difference. If we apply the attack item again, our attack becomes 300 and we kill 300 Goblins, not 100%, but 50% more then before. But if we apply the life item now, Goblin life is halved and we kill 400 Goblins, a 100% increase. And that is diminishing returns for ya: each consecutive added bonus becomes less effective -in this case the attack bonus- , such that other bonuses become more and more effective when used…Now, up until now, this was never an issue with gear because the gear bonuses were not THAT high to make it really noticeable. However with the Replenishing and Necromantic sets, we get introduced to this effect very distinctly, because the bonuses they offer are so incredibly (in my view ridiculously) high. And this will make finding the perfect gear set-up more difficult and experimental in nature then it used to be. Please take note of this. When newer, even better sets come out in the future, do NOT mindlessly equip the full set, but mix it with gear with different types of offensive and/or defensive buffs to see whether diminishing returns plays a role (and it will), to come to the best mix of items….Cheers! This entry was posted in Articles, General and tagged attack, attribute, bonus, defense, diminishing return, diminishing returns, equipment, gear, Goblin, hero equipment, kabam, kingdoms of middle earth, KoM, necromantic, replenish, replenishing, void by beardmonkey. Bookmark the permalink. How about on attacking? Is there a diminishing returns on pvp? Attack and foe life at 314 and 274 atm. there is no cap. Diminishing returns start at 1%. But you only start to notice it really at higher levels of buffs. The first 10% attack buff you have will have more effect than the second 10%, but you hardly notice it at those levels. Now say you have another gear item with 5% life debuff. The question becomes when the 5% attack debuff becomes better than another 10% attack buff. And the answer to that question depends on all your gear, perms, guardian, runes etcetera, there is no one answer to that question. Like with replenish and void: replenish has much higher buffs, so the diminishing returns arent that bad in the beginning. But as you keep adding items, there comes a point when the high buffs of replenish are LESS effective than the smaller debuff from void. At this tipping point, you equip void instead of replenish. Currently 3 rep 2 void is still a good setup, but it could well be with the new gems and ever better gear, at some point 3 void 2 rep becomes better. Like I said, it all depends on the total sum of buffs….And there isn’t a magical formula for that unfortunately…. Thank you for your response. I guess I shouldn’t have said cap, but more along the lines of this tipping point you speak of. You say that it depends on the total some of the buffs, so how do I know when I have gone over that tipping point of, lets say, life; so I can then start adding more attack debuff? And then how much of that can I apply before I run into the same thing? Could you say, I would be safe to assume, that having the same amount of Life and Attack Debuff or Attack and Life Debuff is ideal? replenish sword, bards black arrow, void amulet, void ring, replenish cloak. And use this combo on bard for the lake shore campaign. ?? Has anyone tested this yet? What about if we mix 2 pieces of necro with 3 pieces of replenishing. Will that be better than mixing in void with replenish for campaign? no in principle not, because the focus should be defense (replenish/void). Only with a certian amount of buffs does it help to equip only the necro sword, but that is just for a few lower levels…. Why wouldn’t mixing in a necro gear be more effective against diminishing returns for defensive stats using full replenishing (as opposed to using void gear)? 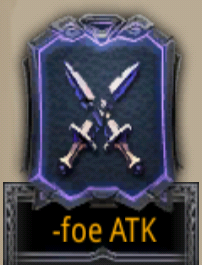 Because the -foe attack on necro is much lower than on void, and -foe attack is the desired defensive attribute. I believe base -foe attack on a lvl 1 piece of necro is 1% and 2% and on void its 8%, when fully upgraded the void has much more -foe attack than necro. Necro is superior for offensive tk tho because for offense -foe life is the desirable attribute and it is very high on fully upgraded necro. the best mix is 3 replenish and 2 void. The best set is amulet and ring void cause you got attack debuff and got 200% of life either. Does the same applies for TK or just in campaign mode ? what did Snape say to Dumbledore about Lilly?? Thats why gendalfs staff performs better with other necro gear. Similar situation. Excellent! Really! So waht would be the best config : 4 Resplenish and 1 Void ? Or 3 Resplenish and 2 Void ? Thank you.